Alicia Martinez, the ward of Los Angeles oil millionaires, is thrilled to be cast in Revenge of the Aztecs, an epic film being produced by her best friend's father. But when idols topple, rocks roll down hills, and other mysterious events occur, Alicia must find out if these happenings are just accidents or if she is the target of a criminal plan that threatens the completion of the movie as well as her safety. If they're not accidents, who is behind them? Could it be someone Alicia has loved and trusted for years? And if it is, can Alicia ever trust again? 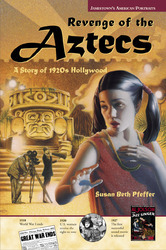 Set in the Hollywood boomtown of 1923, Revenge of the Aztecs is a fast-paced story of movie making and mayhem.